This has been a painful week for all Sikhs living in the United States. Thank you to those who have reached out with your support to your local Sikh community. Most of our families are still trying to make sense of last weekend’s tragic shootings at the Sikh Temple in Wisconsin.For me personally, this incident seems to be a symptom of much larger problem of racist and ant-immigrant sentiments pervasive in our politics and society that implicate all minorities and people of color. However it is also true that Sikhs, especially turban wearing Sikh men, often experience even more racial profiling and discrimination in this country because of their outward appearance. Despite Sikhism being a relatively large religion there seems to exists general ignorance and misunderstanding of Sikh culture and community. As a Sikh and as an anthropologist and filmmaker, I am committed to changing that and creating more awareness and understanding. 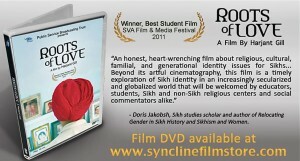 So I have made my latest documentary film Roots of Love: On Sikh Hair and Turban available to be viewed online for free. The film explores the significance of unshorn hair and turban among Sikhs in India. My hope is that this film would offer some insight into our religion and culture and help answer questions viewers might have about the significance of unshorn hair and turban in Sikhism. Please feel free to share the link with your friends, colleagues as well as your students. This entry was posted in Education, Press Watch.